April is a truly enchanting time of the year – the greening of the countryside is one of the joys of living in a temperate part of the world where the seasons are so distinct. The birds are busy building their nests – listen for the first cuckoo. The bluebells begin to carpet the woodland floor, violets appear in the hedgerows, the scent of crab apple blossom is in the air – the Spring is in full swing. There are around 500 species of violet in the world. They are typically found in moist and slightly shaded conditions such as hedgerows. 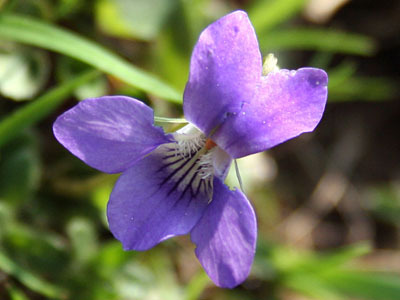 Common Dog Violets may be found in abundance in the hedgerows around Cilybebyll as well as in a few spots at Plas Farm. They are a favourite food plant of many butterlfies. In the Welsh hills, lambing is often not complete until the end of the month, which means there are still plenty of cute new born lambs to see as you walk around the farm. Hill farmers put their ewes to ram later than in lowland regions as the five-month gestation period is timed to ensure the lambs are born when the weather is warmer. Although temperatures are steadily rising, the grass does not begin to grow until the soil reaches the critical temperature of 6 degrees centigrade. A cold snap in April can mean a shortage of grass. 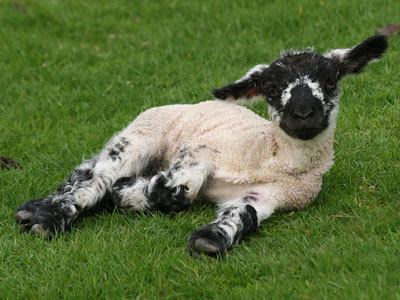 The field in front of the holiday cottages are filled with lambs and their mothers at this time of year. 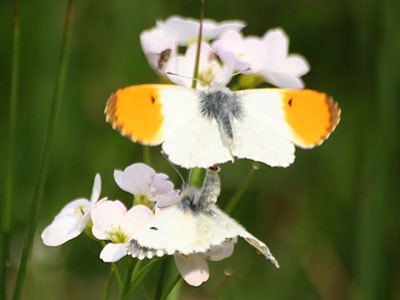 The orange tip butterfly is a colourful symbol of spring time. It appears late in April and may be spotted about the farm, never far from it's favourite food plant - the cuckoo flower. The butterflies each live for about 18 days. The bright orange tips to the males' forewings (the females lack the orange) are believed to be aposematic, acting as a warning to birds that the butterflies contain toxins derived from the larval foodplants. It is notable that many other butterfly species also have very brightly coloured males, but plain females. One reason for this is that males are far more active, constantly flying in search of mates, and in constant danger of being attacked, so they need to advertise their toxic nature. The beautiful mottled green markings on the underside hindwings are an extremely effective camouflage. The colour is not caused by green pigment, which is rare amongst butterflies, but is an optical illusion caused by a mottling of black and yellow scales. As with many other butterfly species, female Orange-tips must mate within a couple of days of emergence, after which they appear to lose their attraction to the males, so the staggered emergence is nature's way of ensuring that there are plenty of males available when the females emerge. The pair in the picture were mating on a cuckoo flower in the rush pasture on the mountain behind the holiday cottages. A wide variety of birds may be seen at Plas Farm due to the varying habitats that exist at the farm. At the top of the farm, grassland turns into open mountain heathland. 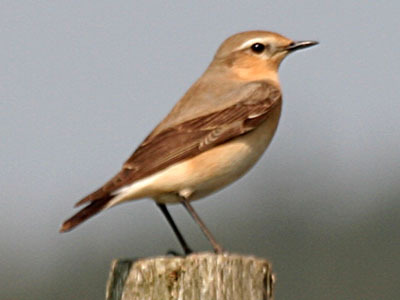 One of the birds seen here, sometimes resting atop a fence post, is the Wheatear. It spends most of its time on the ground - hopping or running around. It eats insects and nests in rock crevices and rabbit burrows. It it blue-grey above with black wings and white below with an orange flush to the breast. It has a black cheek. In flight it shows a white rump and a black 'T' shape on its tail. It is a summer visitor and passage migrant having spent the winter in central Africa. Its English name has nothing to do with wheat or ears, but is a bowdlerised form of white-arse, which refers to its prominent white rump! April is when the countryside becomes green as the leaves come out on the trees. Some species are earlier than others. 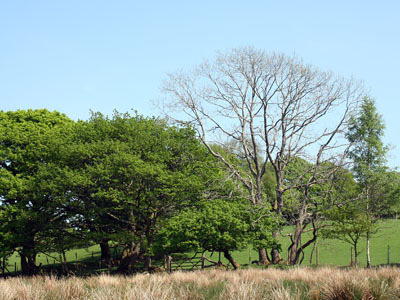 This picture shows Welsh oak (already in leaf) alongside a bare Mountain Ash. There is an old country saying "Ash before oak expect a soak, oak before ash expect a splash." In 2007, the oak came before the ash so we are in for a fine summer! April is a great time to watch the tremendously bold colony of Jackdaws that live at Plas Farm, nesting in the old farm buildings. 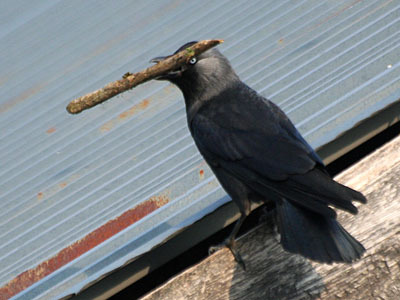 The Jackdaw is Wales's smallest crow - smaller than a Carrion Crow or Rook, but about the same size as a Jay. Like all the crows, Jackdaws are inquisitive and intelligent birds. Adult Jackdaws are all black apart from their grey nape, shoulders and ear-coverts and light grey (almost white) eyes. The bill and legs are black. Their call is an unmistakable high-pitched metallic sounding "kyow" or "tchack", after which it is named. The Crab Apple is native to Wales and is an ancestor to the many varieties of edible apples that we eat today. Towards the end of April, the Crab Apple trees at Plas Farm display a beautiful fragrant blossom that is a sight to behold. It is also highly fragrant. 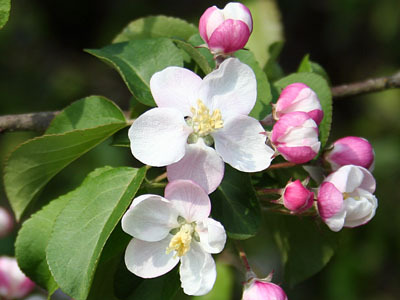 The name ‘Crab’ is probably derived from the amazing shapes the wild apple tree is able to create. Its low trunk, hanging branches and vivid aura can give the impression of a giant crab-like creature. The scientific name of the species “Malus”, is derived from the Latin root word ‘mal’, meaning bad or evil, because it refers to the association of the Apple with the fall from paradise. The other scientific Latin descriptor is ‘sylvestris’ which means 'of the forest or the woods’. Of all the spring flowers, bluebells capture the character of the season, when warmth has returned but the canopy of leaves has not yet closed. They grow so closely together that they appear to blend together like a carpet – one of nature’s most stunning displays – under a canopy of green woodland trees. Wales's bluebell woodlands are of international importance - the British bluebell represents over 50 per cent of the world population of the flower. However, interbreeding with Spanish bluebells and the resulting hybrids is posing a threat to our native variety. The Spanish bluebells were introduced to British gardens in the 17th century, but it wasn't until the 20th century that they escaped into the wild. As a result, a third of bluebells are either a Spanish or hybrid variety, and one in six bluebell woods contains a mixture of all three species. 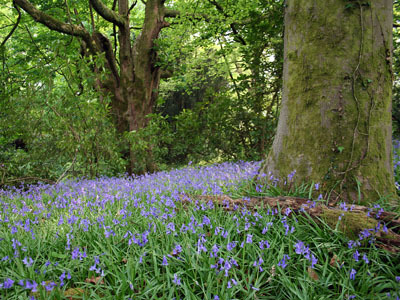 The bluebell woodlands at Plas Farm contain only native British bluebells, as you will be able to tell by the deep violet colour, drooping bells and strong sweet scent that fills the air as you stroll through the woods near our holiday cottages. 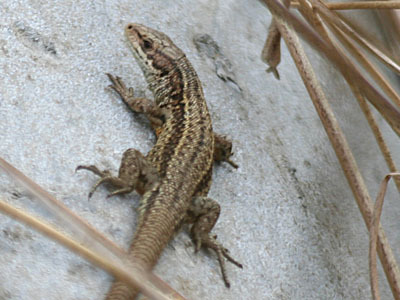 The common lizard is one of only six types of British reptile. They hibernate from October to March. The lizard in this picture was spotted sunning itself on the metal of a calf feeding trough in rush pasture on the hillside behind the holiday cottages. Lizards are active during the day and spend the morning and afternoon (but not the intense heat of midday) basking in the sun either alone or in groups, going to find food when their body temperature reaches 30 degrees Celsius. They hunt insects, spiders, snails and earthworms. They stun their prey by shaking it, and then swallow it whole. They lizards can grow to 18cm in length, although they are usually between 10 and 16cm long. After emerging from hibernation, the males defend breeding territories from other males. The young develop over 3 months within egg membranes inside the female's body, which they usually break out of as she gives birth. They may however remain inside the egg membrane for several days before breaking out (using their heads rather than an egg-tooth to rupture the membrane). Litters of 3-12 young are born from June to September, after which time the mother shows no parental care. The young feed actively from birth and quickly disperse.